If you are thinking of selling your home in the near future – remember small improvements can mean a great deal. Look at your home the way a buyer will look at it. Repaint those marked up walls and woodwork, fix that leaky faucet or running toilet, clean the windows, fix window screens, clean the switch plates, polish the cabinets, regrout the bathroom. If the carpets are soiled have them professionally cleaned. Replace the drip pans on your stove top if they are dirty. Look at your faucets, showerheads, toilet seats and light fixtures, these can be replaced inexpensively and can make a big difference in updating your home. Use the highest wattage bulbs allowed to show your house in the best light. These small and inexpensive fixes will pay for themselves in the sales price. Declutter, Declutter, Declutter – Your home will look much more spacious with less furniture and fewer knick-knacks and personal items. Get rid of excess furniture, clean out the closets and donate, toss out, have a garage sale or put in temporary storage anything you can. Remove furniture and items that don’t fit the room’s purpose, like exercise equipment in the bedroom and a work desk in the dining room. Buyers will open closets and cabinets, be sure they are neat. Clear your kitchen and bathroom counters to make them seem bigger. Buyers want to imagine your home as their home. They will have a hard time doing that if your things are cluttering the house. Curb Appeal – First impressions mean everything. Give the front door and woodwork a new coat of paint. Get a new doormat. If sidewalks or steps or cracked, think about repairing them. Tidy up or add landscaping. Be sure the grass is mowed. Plant some flowers in the landscape or in pots. Look at the front of your house with a critical eye. If you were seeing your house for the first time, what would you think about it? Keep it Clean – One of the biggest turnoffs for buyers is a dirty house. The house needs to be as clean and neat as possible while it is for sale. Imagine walking into a dirty bathroom while looking at a house. Would you want to buy it? Open windows to let fresh air in. Pet odors need to be addressed. You might love your pet and not mind the smell but prospective buyers do not feel that way about it. All of these improvements will pay off in an easier and more profitable sale of your house. If you are thinking of selling your home contact me at 973-349-6731 or kim.fiore@century21.com for a free market analysis or use the form below. I will work with you so you get the most for your home in the West Essex area. The towns of Caldwell, Essex Fells, Fairfield, North Caldwell, Roseland and West Caldwell are generally know as the West Essex area of Essex County in New Jersey. Cedar Grove and Verona are also in the western area of Essex county. Caldwell and West Caldwell share a K- 12 school system as well as recreation programs and first aid squads. Each town has their own government. Most shopping and many restaurants are on Bloomfield Avenue. Bloomfield Ave runs through both towns. There are 4 neighborhood elementary schools, 1 middle school and 1 high school in the Caldwell/West Caldwell School System. In 2012, James Caldwell High School had 209 graduates with approximately 79% going on to 4 year colleges. Caldwell is also home to Trinity Academy serving grades K-8, Mount St. Dominic Academy for girls in grades 9 -12 and Caldwell College, a private 4 year college. 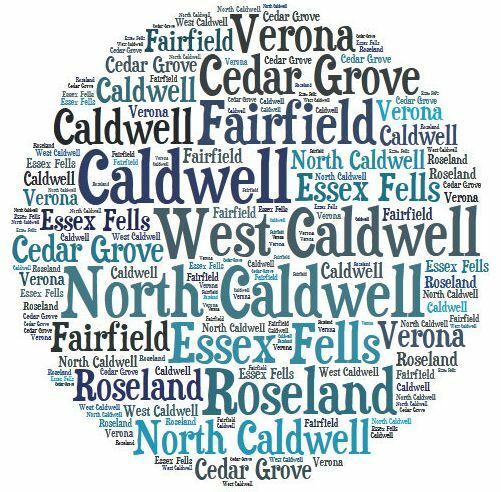 Essex Fells, Fairfield , North Caldwell and Roseland have their own K-6 schools but send all students in grades 7 -12 to the West Essex Regional Schools in North Caldwell. In 2012 West Essex Regional High School had 239 gradauates with approximately 80% going on to 4 year colleges.